A huge funnel is on the barrel's spout. The huge shovel is 2 feet left of the funnel. The shovel is facing the funnel. The shovel is leaning 45 degrees to the back. The shovel is 1 feet above the funnel. The tiny first dinosaur is 1 feet in the funnel. The first dinosaur is leaning 140 degrees to the back. The plant is 1 feet in the funnel. The second tiny dinosaur is 1 inches above the first dinosaur. 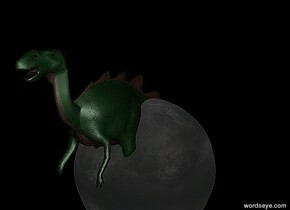 The second dinosaur is leaning 67 degrees to the left. 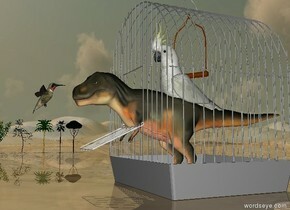 The third tiny dinosaur is in front of the barrel. There is a small derrick 50 feet behind the barrel. The derrick is 25 feet to the left of the barrel. The second tiny derrick is 70 feet left of the derrick. 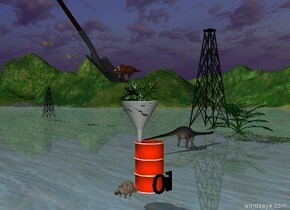 The fourth small dinosaur is 10 feet to the right of the second derrick. The fourth dinosaur is 10 feet above the second derrick. 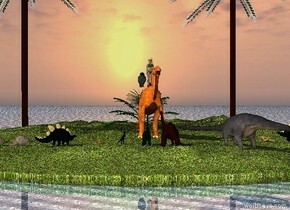 The fifth small dinosaur is 10 feet to the left of the fourth dinosaur. The fifth dinosaur is 5 feet above the fourth dinosaur. The tree is 40 feet behind the barrel. The tree is 10 feet to the left of the barrel. The sixth tiny dinosaur is 15 feet behind the barrel. The sixth dinosaur is 15 feet to the left of the barrel. The sixth dinosaur is facing the tree. 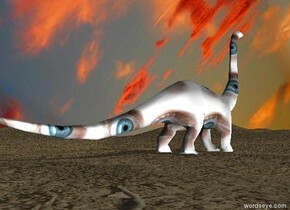 The sixth dinosaur is 1 inches in the ground. "Oil" is right of the barrel. "Oil" is Black. "Oil" is facing 25 degrees to the right. The girl is on the leather dragon. The leather dragon is on the grassy island. The ground is shiny water. Sunset. There are 5 palms behind the leather dragon. owl is near the girl. 10 tiny dinosaurs are in front of the leather dragon. They are facing the girl.